oblThe second half of Agents of S.H.I.E.L.D.’s Second Season just kicked off and already there are threats looming from every corner of the Nine Realms – literally. This episode brought us the return of Lady Sif and the first TV appearance of the Kree. It was Thor meets Guardians Of The Galaxy this episode; but when both turn against our Agents, will our team band together or tear themselves apart? Here’s your Closer Look at this week’s episode, “Who You Really Are”. With Lady Sif having lost most of her memories due to a battle with the Kree warrior Vin-Tak, it’s easy to see why this episode is entitled “Who You Really Are” as Coulson and the team must help her reclaim her memories. Though this episode’s focus was much more than just REMEMBERING “who you really are”; but also DISCOVERING “who you really are” as Skye learns the truth Terrigenesis and the teams opinions of her. This episode was all about revelations; but beyond Lady Sif and Skye, the team is also coming to terms with finding out who ‘each other’ are. 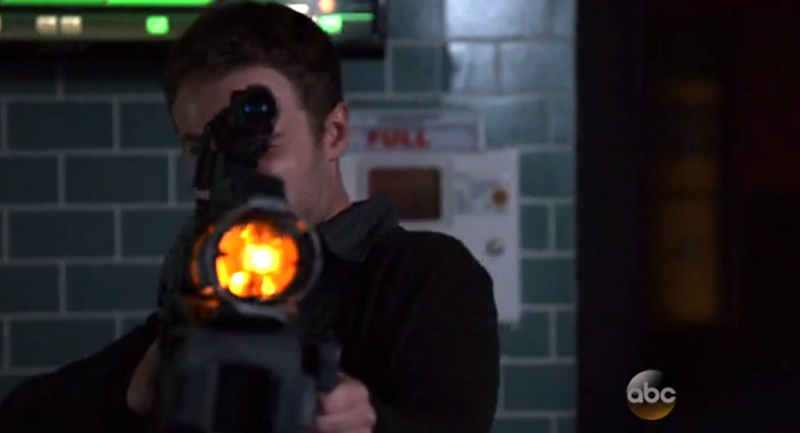 Sure there’s fears about what Skye really is; but there is also discord between Fitz and Simmons. Last week we saw how these two took opposing stances on what to do about these ‘Inhumans’; and this week only further cemented their distance. As Simmons get upset over Fitz lying to her about Skye’s blood samples, Fitz points out that Simmons fears over Skye would indeed get the better of her – as they did when Fitz changed. One final revelation of ‘who you really are’ comes with the juxtaposition of Hunter and Mack becoming full time agents, while Bobbie and Mack are preparing to betray S.H.I.E.L.D. Bobbie might show some reservations; but Mack’s true colors emerge when he strangles Hunter for asking too many questions. The revelations will only get more and more jarring from here on out; and this will definitely be a theme to remember as we progress through the rest of Season Two. As you – and Coulson – remember from the last time we saw Lady Sif in Season One, no Kree have ever traveled to Earth. So then how do you explain the OBVIOUS Kree presence we saw in the first half of this season? The answer is that if the Kree did land on Earth unbeknownst to the Asgardians, then they were there for no good. The Kree are of course a race of extremely advance aliens that have carried out countless wars – and still do as we saw in Guardians of the Galaxy. There are moderate Kree (like Vin-Tak in this episode) as well as radicals (like Ronan in GotG). Sadly, it’s the radicals that ran the old Kree war machine of Terrigenesis. Terrigenesis – as many comic fans already know – was the process by which Kree altered the DNA of other alien races so that they could have hidden abilities, which could be released upon activation by a Terrigen Crystal. These “abominations” would be used to fight the Kree wars for them. This process failed everywhere, except Earth. It was Vin-Tak’s mission to go to Earth and eradicate any traces of these Inhumans before the Kree learned of the success of these experiments and ordered more. Though with all the Obelisks (aka Terrigen Crystals) missing, it seems someone else is already making an army. So how many Terrigen Crystals are out there? 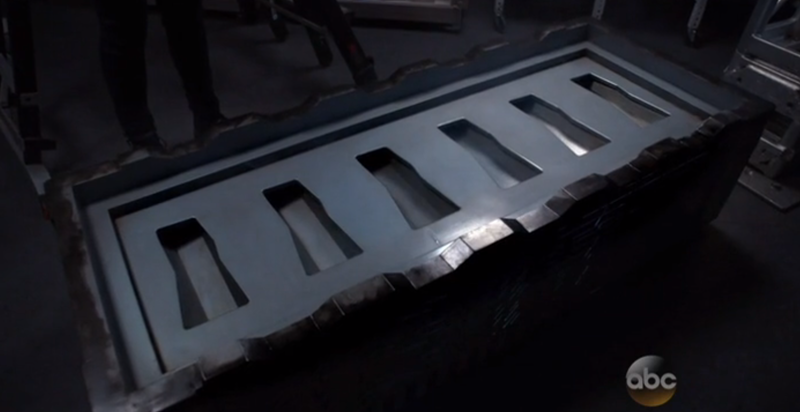 Well the box showed 6 empty spots; and whereas it was hinted at these 6 being unearthed at the same time as the original, it’s unclear WHY Hydra would have only removed one and not the other five. How do I know Hydra didn’t take the other five? I don’t; but remember that we have seen more Obelisks outside of Hydra’s control than within their control. 1 Obelisk in the possession of whomever Gordon was talking to on the phone at the end of the Midseason Finale. This leaves two mystery Obelisks still out there. Now as two awesome Redditors pointed out, just because an Obelisk has been used doesn’t mean it can’t be used again. The Obelisks reveal the crystal upon placement; but there is nothing to suggest that they can’t be used multiple times. Remember, Raina’s and Skye’s was destroyed by Tripp. This could mean that a Crystal could be used multiple times since it’s the mist that unlocked their Inhuman traits. Additionally, this could explain why Cal already has a small group of evil Inhumans to cause chaos next episode. Last week we saw how battle lines were forming within S.H.I.E.L.D. over the emerging Inhuman threat; but this week made the ensuing battle even more dire as the team learned one of their own was Inhuman as well. The individual teams were to be expected; but what is truly impressive is how those truly in the know still choose their side. As Vin-Tak explained to Coulson and May, these Inhumans are weapons and even if they have the best of intentions, they are still abominations. Despite all of that, both still stand by Skye and defend her against a Kree and Asgardian warrior tag-team. Yes, they can acknowledge that wherever Skye goes, ‘death follows’; but they still have to hope for the best and help her to control her emotions and powers. On the other side of the coin, you have Mack who wasn’t present for any of this talk; yet still sees Skye as an absolute threat to all of them. Even Simmons is fearful of Skye, even if she doesn’t admit it. She tells Fitz that she’d of course never come down on her friend for being different; but Fitz reminds her that she did the same to him. Simmons pulled away and treated Fitz different after his accident; so how much more would she pull away from Skye after this. We might not know yet WHO Bobbie and Mack are working for; but this episode definitely gave us a lot of clues as to who they might be serving as well as which of them are really dedicated. For starters, we at least know that they AREN’T working for Hydra; but considering they wanted to call backup when Vin-Tak attacked, we know their organization does have substantial force and backing. This continues our idea that they could be working for anyone from the US Government or a reemerging Leviathan. Some could even guess A.I.M due to Mack’s technical expertise; but I think that was destroyed along with Ironman 3. Whomever they’re working for, one thing is clear: Mack is more dedicated to the cause than Bobbie. From talking with Hunter we can see that she not only cares about him; but also cares quite a lot about S.H.I.E.L.D. She supports Coulson and is hesitant that this entire operation is going to leave a lot of people (friends) dead. Mack on the other hand is constantly questioning Coulson’s leadership and doesn’t want Hunter in on it anymore. Yes, he might considere him a friend; but that didn’t stop him from strangling Hunter to keep the secret. Now it looks as though Hunter was just left unconscious; but he will wake up sooner or later. Which means that whatever Mack and Bobbie have planned, they’re going to ‘pull the trigger’ very soon. 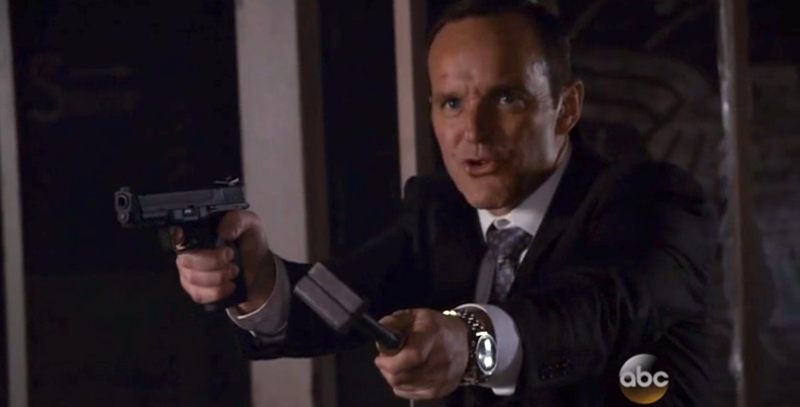 Last season gave us Ward and Garrett’s betrayal; and this season is sure to give us another strike to Coulson’s circle of trust. When Sif initially says she’s looking for ‘Carva’, some could have thought this meant Carva Tessara, a brief Centaurian character in the comics. Of course we learn in the episode that “Carva” is actually the Kree word for “Keys”, which then bring us to “Chaves” which is the Portuguese/Old Spanish word for “Keys”. There are only 7 species that require Nitrogen to breath, none humanoid. He Kree however can use this tech to disguise their already blue skin. The stunning icer guns are back; but this time Simmons has increased the concentration of Dendrotoxins, which could be very dangerous and unhealthy for the targets. Sadly, Simmons sees this as necessary for the Inhumans. Vin-Tak’s truncheon bore an incredible resemblance to a miniature version of Ronan The Accuser’s massive Hammer from GotG. Showing Skye’s powers shatter a gun help to show that Skye’s powers aren’t geomancy or power over earthquake; but rather shockwaves and vibrations themselves. Despite not knowing who Thor is, Lady Sif still smiles at the mention of his name. This is a reference to their occasional romance in the comics as well as the romance fans have been wanting in the films as well. When Lady Sif warned Coulson ‘There are tides in the universe that you cannot swim against”, you might have remembered the Season One group “The Rising Tide” for whom Skye used to work for. Could this group see an actual return or was this just a simple Easter Egg of Skye’s past in reference to her future? With the team in turmoil over what to do with her and half scared to death, Skye has no other option but to lock herself away in isolation. It looks as though next week May and Coulson will bring in a specialist to help Skye adapt to her powers; but will everything go as planned when Cal unleashes his group of evil Inhumans. Will Cal’s plan work or will Skye find her focus and be able to put a stop to it? We’ll find out next week, so stay tuned for the next Declassified! March 11, 2015 in Marvel's Agents Of S.H.I.E.L.D.. Tags: ABC, Agents of S.H.I.E.L.D., Agents of Shield, Marvel Cinematic Universe, Marvel’s Agents of S.H.I.E.L.D. Why cant all the Gordon related obelisks be the same one? Hmmm, fair. The one Gordon used to transform and the one he had with him COULD be the same. I guess it all depends on it the Obelisks remain in crystal form or can be disguised again. Guess we shall see. But at the very least we know 1 is gone, 1 is in Gordon’s possession, and another is with the person Gordon was talking to since he references them both being able to ‘see’ how the Obelisk were reacting to another being used. OH, that is a possibility too. You see SWORD was a counter-part to SHIELD in the comics – obviously – but after Fury’s departure the relations between the two organization became very strained. Also, SWORD was more focused to alien stuff. So with the new focus on Inhumans, that is a very good theory actually. 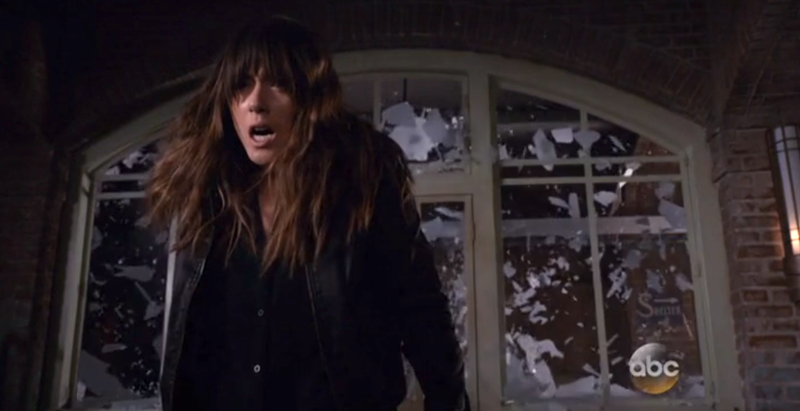 Either way, I personally think Bobbie and Mack are with someone ‘good’; but still not happy with Coulson. I also heard a theory they are working with Maria Hill and want to recruit what’s left of SHIELD into Stark’s employ, which could enforce/start to set up the ideas of Civil War and Tony trying to create his own larger peace keeping organization and standards of conduct outside of the Ultron program.